We all want the quality of our drinking water to be above board regarding taste and smell. Our water supply from the city, picks up several contaminants along the way, making it difficult to trust its safety fully. Among the many reasons to acquire the best countertop water filter includes their associated efficiency in removing contaminants from our drinking water. A quality water filter goes further than removing contaminants, and alkalizes it, making it healthier for our consumption. And did you know that a good countertop water filter can help you lose weight? Well, believe it or not, but the healthy alkalized water plays a significant role in achieving that. But that does not mean that these water filters are without their shortcomings. For starters, they take some space and can adversely impact our kitchen decor. After a thorough analysis, the following are some of our best picks of countertop water filters, based on many features such as quality, ease of use, affordability, and durability among others. Have a read of the best countertop water filter reviews and pick your best. The table below compares and summarizes the Top 12 counter top water filter in more details. Best RO Water Filter System Faucet Filter 93% of Fluoride, chlorine, and Common Contaminants. New Wave Enviro Faucet Filter Chlorine, Common Contaminants. Best Budget Pick Faucet Filter Chlorine, Common Contaminants. Aquasana Countertop Water Filter Faucet Filter Common Contaminants. How Does a Countertop Water Filters Works? 1. What Types of contaminants you want to remove? 2. Filter Pitcher Or Faucet Filters: What To purchase? There’s often an excellent reason, in a review, to give a product the top spot. Mostly, the countertop water filter ticks most of the boxes on several factors. Well, without mincing any words, Big Berkey BK4X2 Countertop Water Filter System removes most of the heavy metals in your water, making it safe for drinking. The Big Berkey features a heavy-duty steel housing for durability. You see, the filter system is, for the majority of the time, in contact with water and other contaminants that corrode metallic surfaces, further contaminating the water. And it’s not only the heavy metals but also the harmful pathogens. Tests indicate that Big Berkey gets rid of all the harmful pathogens that make you sick – you could have safer drinking water. Its fluoride removing capacity is up to 95%, which means that you get some of the purest and sweet tasting water you will ever drink. It also removes Volatile Organic Compounds like- benzene, ethylene glycol, formaldehyde etc. from your drinking water. Another good things about this gravity water filter is that, it is convenient to use it anywhere you want. It's perfect for both indoor and outdoor use. A big capacity filter is always ideal as it has sufficient water to keep you hydrated for a long time. In fact, the filter holds 2.25 gallons, enough for up to 16 people. It is the type of filter that you take to the office with not so many employees. Moreover, we were impressed by the water filtering capability of this gravity water dispenser. The unit comes complete with two black and two arsenic fluoride filter element. The black filter element has a decent filtering capacity of 3000 gallons, for every filter element. On the other hand, each fluoride filter element has a capacity of 1000 gallons, and that is a right amount, unmatched. The decent life span of the water filter element will save your money since, you will not have to change the water filter frequently. Click to find out more. N.B: Although this unit comes with 2 black and 2 fluoride filter, there is still option for using four black and four fluoride filter element, if you want to increase your water filtration speed. While Big Berkey BK4X2 is a top quality water filtering system, some Big Berkey water filter reviews complain of rusting inside the stainless tank. Some could taste this rusting in the water. Another shortcomings of this water filter is that, it takes time to filter water which might be an issue for some people. The price of the water filter does not always mean that the system is more efficient than the other filters, and nothing best underscores this fact better than APEX Countertop Drinking Water Filter. It is one of the best countertop water purifiers based on several factors. For starters, the Apex Countertop Drinking water is NSA certified, that means you can trust the filtered water quality of this water filter. When it comes to efficient contaminant removal, you can rely on APEX Countertop Drinking Water Filter as it has a long list of contaminants that it removes. Among these undesirable elements the countertop water filter dispenser gets rid of include radon, sediment and chlorine, mostly found in tap water. It also removes common disease-causing pathogens such as Giardia cysts, as well as, pesticides and mercury – it’s undoubtedly a long list. This water filter will not just removes contaminants from water, it will also remineralize the calcium and magnesium which are beneficial for your health. Additionally, It makes the water drinkable by keeping the Ph level between 8 to 8.5. Another good things of this water filter is that, one single filter can purify up to 750 gallons of drinking water. That means, you don't have to change the filter frequently. The best countertop water filter system like this one is not only budget-friendly but also easy to use. It has a design that allows it to sit comfortably on the kitchen sink or countertop. The unit easily connects to any standard size faucet you have, and you don’t need a handyman to install it for you. The package comes with all the equipment you need to quickly install the system and quench your thirst with a refreshing glass of water. The Apex countertop water filter is the best example that you don’t need an expensive system to have the best quality water. Furthermore, you will no longer need to keep purchasing expensive bottles of clean water for home consumption. It is quite easy to change the filter and might end up disposing of the whole unit if you are not the patient and careful type of person. According to several apex water filter reviews, the system may start growing algae after a period of use, and exposure to sunlight – not a good thing indeed. Water distiller systems give you some of the purest water you can get. The Megahome Countertop Water Distiller is an efficient unit that provides sufficient water for drinking. To start the megahome water distiller review, it is essential to know that the product is from a UL-listed lab, meaning that it meets all the necessary safety standards. Its rate of water distillation is one gallon in 5.5 hours – not so bad. The water distills at the right speed, not too slow like some distillers on the market. Among the benefits of using water distillers is their efficiency in removing water contaminants, giving you healthier water for consumption. Megahome Countertop Water Distiller steams at 212 degrees, killing all microorganisms that would cause a host of illnesses. The process also leaves behind a wide variety of contaminants, and steam forms to give you the freshest type of water. 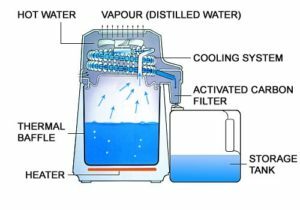 Apart from the steam distillation, the water filter also features an activated carbon filtration to ensure an efficient water filtering process – there is no way harmful contaminants would bypass this two layers of filtration. The steamed water travels through a glass-lined nozzle, and into glass collector – no plastic contact. The boiling chamber is stainless steel, no rusting or chipping, thus keeping the quality of your water high. Megahome Countertop Water Distiller is one of the easiest to use. All you need is put some water in the device, and switch it on – as easy as ABC. It does not require much maintenance like other varieties of water filters. It does not even need expensive filter replacement like the others that you must ensure to keep track of the capacity of water filtered. Like other water distillers, this device may not give you sufficient water especially if your household has more than four individuals. And it does take long time to distill water. ( 1 gallon/5 hr ). Another mention able negative is, the faucet is tough to remove and replace from the unit. A drinking water faucet that you can install anywhere in the house is ideal. It means that you will always keep hydrated. Ecosoft Countertop water filter system employs a coconut shell based carbon filter which is very efficient at organic chemical adsorption. And that is the biggest selling point of this unit. The countertop drinking water filter is budget-friendly and efficient in removing what you would refer to as filth, from your drinking water. Its efficiency goes as far as removing harmful contaminants such as lead and chlorine that often characterize tap water – you can’t trust tap water these days. Speaking of taste- this water filter will blow your mind with it's refreshing water. The best thing about Ecosoft countertop filter is that you can install it anywhere, as long as there is a faucet. That can be in the bathroom, kitchen or even living room. It is also not something that will prove a headache in any way when it comes to installation. In fact, it is so easy that it will only take a few minutes to have it up and to run. That means you will not have to wait for too long to enjoy your glass of water. The tragedy of acquiring an inefficient filtering system is in low period maintenance. It is no surprise to find a system with a filter cartridge that only lasts three months. However, the Ecosoft countertop filter cartridge gives you a decent six months or 1500 gallons – that is decent for a small family. The filter comes with two faucet adapters, a plastic wrench, as well as, a seal and ring for a leak-proof installation – typically everything you require for installation. There are complaints regarding quality issues. Users state that it doesn’t work as manufacturer claims. There are many water filtering systems out there, but you cannot say that one is better than the rest. Their efficiency may vary, but that does not mean that one will be best at filtering all contaminants from the water. In that regard, APEC Portable Countertop Reverse Osmosis Water Filter System is unlike most other filters in the manner it functions. It is quite efficient and ensures that your drinking water is clean and worth every drop. It's one of the best portable reverse osmosis system in the market right now. The reverse osmosis method, the filter employs is efficient and result in crisp tasting water. A glass of refreshing and clean water is just a few turns off the faucet away – an exciting prospect. It is a system featuring high capacity filters for efficient filtering and long lasting performance. In other words, it is a reliable system, with almost everything you need. The NSF certified countertop water filter works with water pressure between 40psi and 80psi – not too shabby. It is an ideal piece for apartments, retirement homes and condos – to name just a few. Among the contaminants, the system removes include, chloramines, as well as, chlorine – the elements that interfere with the taste of your water. Research found that, Reverse Osmosis Water Filter System can significantly removes few bacteria, protozoa and viruses from water. Not only this, According to few user reviews, this water filter system also did an excellent job in decreasing TDS ( Total Dissolved Solids ) from their household water. The system is installation-free, and you only need to plug it into a standard faucet, which only takes a few minutes. Anyone can plug and use it efficiently – quite a breeze. However, you need to note that the system only compatible with standard faucets, no pull outs, and no sprayers will fit. The design of this countertop water filter is not what we would refer to as appealing. In fact, it looks like some mini oil refinery sitting on top of your counter. Another, thing we didn't like about this water filter is that, the hoses is only about 3" long, that means you can't run it very far from the water source. Among the numerous reasons to own a compact water filtration system includes, the space saving factor on your counter. It is not everybody, that has loads of space for every kitchen device on the counter, and living spaces can be smaller than you think. The Home Master countertop filtrate system is your ideal go-to system if you want something compact to clean your drinking water. Primarily, do not link its compact size to inefficiency. In fact, the filter it among the most efficient you will find on the market. It employs a three-stage filtration process that effectively removes fluoride, chlorine and other chemicals like- herbicides, hydrogen sulfide, THMs etc. that affect the quality of your drinking water. As a result, the filter gives you great tasting water wherever you are. The unit is compact and lightweight, making it highly portable. You can throw it in your pack, and install it in your office. The installation of the system is not difficult. It will only take a few minutes to be set up and enjoying healthy and great tasting water. Typically, the unit connects to a standard faucet, and can work with any level of water pressure – it is quite versatile in that aspect. Well, the filter may not remove some of the contaminants and may need another type of water filter if your water has a significant amount of harmful chemicals like lead. Also, there’s no clarity as to the elements that the filter removes – more clarity is always necessary when it comes to water filters. It also does not remove bacteria. For that, you will need a better system like this one. It will not change the Ph of the water in any way, and if you are after alkaline water, you might, as well as consider other options. New Wave Enviro 10 Stage Water Filter System is another compact system that fits well beside the tap. However, that is not the only good about the unit. The countertop water filter kicks out some of the primary contaminants in your drinking water. Specifically, the unit ensures all contaminants in your drinking water are below the EPA levels – the recommended levels. That means you get not only clean water but also safe and refreshing. The unit enhances the taste of your water so that nothing is standing in the way of drinking enough for your needs such as when working out. And talking of efficiency, the water filter system removes the majority of contaminants in the water such as arsenic, chlorine, and fluoride. It also removes pesticides, floating solids, lead, mercury and even herbicides in a 10-stage filtering process – it is one device we would like best dub ‘a miracle jar.’ It is a real workhorse when it comes to ensuring your water is safe to drink. Apart from this, the water filter cartridge can significantly process approximately 1500 gallon (5678 liter) of water before replacement- enough for a average sized family. Installation of this system is what we would commonly refer to as a walk in the park. Installation and replacement of cartridge is super easy And if you feel that the unit is better out of sight, there are conversion kits to install it under the sink – sold separately, of course. It is not the most effective and will leave some inert elements such as the fluorides, chlorides(not Chlorine). Therefore, it is necessary to test your water to determine what you need to be removed from your water and consider whether the system will get the job done. If your water contains fluorides or similar inert elements, then you should consider to buy a Reverse Osmosis system to remove those elements. Several customers highlight several issues, and among them is the poor design that sees the product reduce in efficiency and develop leaking problems. Some of us are quite specific as to the quality of our water, and we want nothing but the best. Well, Berkey BK4X2-BB Big Berkey Stainless Steel Water Filtration System is not too far off in that regard. In other words, the system is efficient and boasts an excellent capacity. At the purification rate of 3.5 gallons every hour, the water filter system ensures that you have a reliable supply of safe drinking water – some comparable systems are much slower, and do not boast the same level of efficiency. Each of the filter elements has a decent lifespan of 3000 gallons. That means you will not require constant changing of the filter and that translates to reduced maintenance needs. N.B: Keep in mind that, the unit comes standard with two black filters, but there is option for four filters. The four filter option will transform undrinkable water to pure water at a flow rate of 7 gallons per hour. It will clean your muddy water efficiently, and so it is ideal for relief organizations and missionaries out there – it helps keep the good work going. The system will not remove any minerals in your water. It is, therefore, quite efficient in keeping what it should hold and remove everything the contaminants that intrude your water. It has a holding capacity of up to 2.1 gallons – enough to keep you hydrated, healthy and productive. The container is high-grade stainless steel for durability and safety. Stainless steel reduces any chances of re-contamination. Some filtering systems are not the most appealing items to sit on the kitchen sink or counter. However, Berkey BK4X2-BB Big Berkey doesn’t perform so poorly in the appeals department. It is something that looks as if it is its fundamental right to be there. This Barkey water filtration unit ( that comes with only two black filters) will not filter out all harmful elements in your drinking water Like- Fluoride. In that case, You should consider this Barkey water filtration system that comes complete with two additional Fluoride Filters along with regular black filter. There may also be filter quality issues. For example, the filter has a plastic nut, which is not the best. There are few complains about the standard spigots that feels pretty cheap for some users. There are not many appealing countertop water filtration systems out there, and this is one of a kind. CleanWater4Less® Countertop Water Filtration System has this attractive look that will compliment any kitchen decor. It looks something like the coffeemaker, and we all love coffee in the morning – at least the majority of us. At 10000 gallons, you have yourself a reliable system that will provide clean and healthy water for a long time. You will no longer need to lug along many plastic water bottles that contribute to significant harm to the environment. The Water filter has three water filtration stage including a GAC (Granular Activated Carbon) stage which effectively removes chlorine and other contaminants in the water so that you can finally enjoy your glass of water. Its water tastes great, without the dirt and other foul tasting elements. It’s interesting to think of a water filter that comes with non-replaceable cartridges. CleanWater4Less® is that kind of filter, believe it or not. The drinking water system is easy to install and does not require any plumbing. And the fact that does not have any replacement filters ensures that the cost of getting clean water is less. The unit comes with a variety of adapters to install on different faucet types, thus making it versatile. According to some of the users, the device does not remove all the chlorine taste. It is not entirely useful in that aspect, and may not be ideal for the people looking to treat tap water with fluoride. The water filtering system may also have a leaking problem at the faucet. Talking of cost-effective and attractive water filtering systems, this is definitely at the top of the pack. The unit comes with a beautiful design with two chambers. But it’s not the appeal that makes this water filter system a top product. The filter system produces clean, sweet and healthy alkaline drinking water to keep you in perfect health. The countertop filter features five functions, and so it is pretty versatile. Necessarily, you can purify, filter, alkalize, mineralize, and magnetize – entirely something! The system mimics the process of natural mineral springs to give you refreshing and invigorating water. 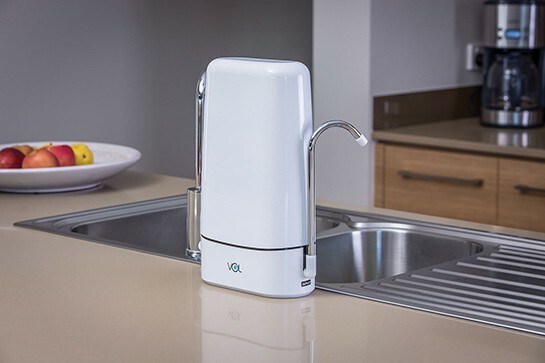 It is one of the best countertop water filter because it can removes a variety of contaminants including chlorine, bacteria, and artificial chemicals. The filter system removes terrible odor and varies the Ph level to slightly alkaline. And unlike most other systems, the water filter will produce the necessary minerals to your water, leading to a delicious, spring water-like drink. And the best thing is that it does not utilize electricity or plumbing, it is a simple design device – you don’t need to know much to operate it. The system filters half a gallon within three hours, with a full top reservoir. The lifespan of its ceramic filter is a good one year or 1000 gallons. But the five-stage mineral filter will go for six months or 500 gallons. The system comes complete with the mineral cartridge filter, a ceramic filter, a magnetized spigot, and maifan mineral stones. That means you will not have to purchase any additional item to complete it. From the above zen water systems review, it is clear how functional the filter is, however, it is not the best for water that is microbiologically unsafe. That means the system has limitations and will not clean all types of water. It will not remove fluoride and some other elements in your drinking water. It is yet another best countertop water filter system that demonstrates a high level of efficiency. The system is quite compact and will not take a lot of kitchen counter or sink space, making it quite ideal. Check out the rest of the aquasana aq 4000 review for the other features. The filter system achieves an efficiency rate of 97% at removing chlorine from your water – at least according to the manufacturer. It also removes as many as 76 other contaminants within your water leaving you with a clean, refreshing glass of water. The NSF certified aquasana powered water filtration system removes lead and other heavy metals that may cause ill health, from your water. It is quite efficient and will not leak dirty water into the clean water. And while it will remove various contaminants, it retains the healthy minerals such as magnesium, potassium, and calcium. Just like other sink-top filters, Aquasana Countertop Drinking Water Filter System is easy to install. The unit comes with everything you need to attach the system to the tap effectively. You don’t need any plumbing knowledge to operate this system, and filter replacements are only a simple twist. In the majority of cases, the filter should last you about six months – not too bad, if you think about it. Filter replacement is expensive. The difference between replacement and purchasing an entirely new system is small, and according to aquasana water filter review, many would instead buy an entirely new system. It is also difficult to change the inner filters since the unit is complicated to open. Also, many users complain about a faulty connect valve to the faucet. The overall filter design is not the best. Having this filter in your kitchen or living room is entirely a joy. Well, KOR Water Water Fall | Home Water Filter is attractive to look at since it has this hourglass design. The beautiful filter makes a statement the same way an espresso machine does. The system produces some pure and great tasting water for your whole family. It utilizes an all-natural coconut filter to clean your water. That means no harmful components from the filter seep into your drinking water. The filtering process is sustainable. The NSF-certified filter will remove chloramines, chlorine, bad odor and bad taste from your water. It is versatile and will not only act as a filtered water pitcher, but you can add your favorite fruit and make your water flavorful. Therefore, the device helps you drink more water as you should keep sufficiently hydrated. The water filter system comes with everything you need to filter and come up with clean water for your whole household. These coconut filters have a lifespan of about four months or 80 gallons, which is much better than other filtered pitchers. Some systems are quite difficult to install and take some time to get started and have your very first glass of water. However, this system needs no installation, and all you need is put water on the top chamber and wait – how easy could it get? The main disadvantage of having a water filter pitcher is that you need to fill it with water periodically, or you will run out of drinking water. Some kor waterfall reviews say that it leaks. Water is critical to our wellbeing, and most importantly, life. We can live without foods for weeks, depending on stored fats, but you cannot go without water for a few days. You see, two-thirds of the body, including the bones, is water. It is, therefore, critical to ensure we have reasonable access to healthy water; not only healthy, but also pure and tasty. Countertop water filters are convenient, innovative devices that remove impurities from our water. These devices alkalize the water, making it tasty, and worth drinking. But why is it necessary to use water filters? How do these devices function? Among the many qualities of water includes its exceptional ability to dissolve elements. That’s why you toss your dirty shirt into the drying machine, and it emerges looking spotless. However, this very quality can prove a disadvantage. In its way through the ecosystem, and what scientists refer to as the water cycle, water picks several elements. It is, therefore, almost impossible to tell if the water in our glasses is not without all manner of unfriendliness within it. Physical filtration where the device displaces the large impurities and chemical filtration where it removes the bad elements through a chemical process. For the physical filtration process, the water filter utilizes a fragile membrane of the sieve to trap dirt. In chemical filtration, the filter removes impurities by passing water through an active substance. When talking about effectiveness in the filtration process, then this is it. The reverse osmosis filter is heavy-duty and can handle any impurity, be it chemical like the heavy metals or dirt. 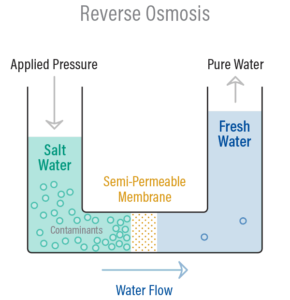 The Reverse Osmosis system can significantly remove a large portion of contaminants from water . However, these systems are quite massive and often under the sink or in cabinets for a little aesthetic appeal. The reverse osmosis countertop water filters are becoming popular by the day, based on their water filtration process, appealing design and ease of installation – no one wants a complicated machine. The RO filters are ideal if you have a spacious countertop in the kitchen. These systems are also exemplary where the family is under significant exposure of heavy metals like lead and where water is hard. When you need extreme purity in your water, a distillation system always comes in handy. Water distiller boils your water, and then runs it through a system coils, converting and guiding the steam into a down container. The boiling process leaves the impurities in a container behind and can later discard it. Even though not all distillers functions the same, it is possible to have pure, refreshing and healthy water for drinking. You can also end up with sweet smelling water that motivates to consume a lot of water, as recommended. Water distillers are not too big, making them suitable for households of up to three individuals. They are a bit slower and may not be the best if you are forgetful or don’t have the time for waiting. Water ionizers are the most innovative class of water filters that you will find. And as you are aware, quality goes hand in hand with a price – they are quite expensive. The ionizer employs a process called electrolysis where the positive ions in the water collect at the negative electrodes and the negative ions go to the other side. Typically, cathodic water that forms on the negative electrodes has a high level of anti-oxidation and alkalinity potential, making sweeter and healthier. Some quarters in the medical field believe that cathodic water raises your blood Ph, reducing risks of diseases, allergies, and irritations. And even though there may be some doubts regarding the health benefits, the resulting water from the ionization process is pure and pleasant tasting. These are effective, portable and ideal for medium or large families. Unlike it other counterparts, filter dispensers do not require electricity to function and thus quite cheap. In most cases, filter dispensers feature upper and lower chambers. There are also several filter features at the middle that do all the work so that the final water that collects on the lower chamber is pure and safe to drink. The whole filtration process only takes a few hours. The advantage of having a filtered dispenser is their portability. They can sit anywhere from your car’s dashboard to your living room tabletop. The only shortcoming is that you have to keep refilling it now and then. If you are looking for a space-efficient, time-efficient, and budget-friendly water filter, then the sink-top filter is your go-to machine. The filter has simplicity in design and collects water as it flows from the tap. It features a filter cartridge in the metal or plastic housing. The filtered water comes out through the plastic spout, where you place your glass for some refreshing water. Sink-top filters do not inconvenience you in a way, sitting next to the faucet and taking minimal space in the countertop. The filtration process is swift even with minimal water pressure from the tap. The filters may not last long, but replacement only takes a few minutes. However, these systems are ideal for people living in rented apartments where they should not do any modifications. Countertop water filters are darling to have for several reasons. Regardless, they also have their shortcomings. Some of the benefits associated with countertop water filters include their ease of installation. Most of them only require the attachment of the tube to the faucet and gravity filters are ready to go the very moment you purchase them – these guys don’t even need the services of an attached faucet. And unlike their counterparts the under sink filters, the countertop filters do not require drilling holes into the sink to install another tap. Some sink materials are quite weak and such intrusion may damage it. But you never have to worry about this since, the countertops don’t need the extra tap, and the extra work. A decent quality countertop water filter will remove a wide variety of contaminants ranging from arsenic to pathogenic bacteria, ensuring it is safe to cook with and drink. The machine gives you peace of mind since you are sure nothing harmful in the water will adversely affect your health. The removal of chlorine, fluoride, dirt and other contaminants mean that your water is not only safe, but also sweet. The countertop filters remove the characteristic sour taste form the tap water, and you can drink more water as required. Having a countertop water filter also means that you can finally ditch the bottled water. That translates to reduced plastic contamination to the environment, and more savings. No need to purchase bottled water for fresh and sweet tasting water. Filtered fresh water is not only healthy but also gentle. The filtered water protects your hair and skin from damage by chlorine and other contaminants. It is always a joy, and the wish of everyone to have a minimal maintenance machine like- a bottom loading water dispenser. Well, the countertop water filters are some of the most accessible devices to maintain. In fact, the only thing you do is replace the filters after some time. The water filters are also by themselves an inexpensive way of getting purified, and sweet tasting water at a single point. The countertop water filters only deal with water coming out of a single kitchen faucet, and which may not be sufficient if you have a big household. Whole house filters, on the other hand, purify all the water entering the home. These countertop water filters are not what you would refer to as discreet. They sit on top of your kitchen sink, where they are visible to everyone, and may not contribute to any aesthetic appeal. Think of something like, a kettle with a hose leading to the tap – not entirely appealing. Another shortcoming is in the matter of efficiency. Countertop water filters are convenient, given their compact size. However, this compactness has its limitations. In essence, their contaminant removal ability is less, when compared to multilevel and larger systems. Furthermore, the amount of filtered water from such systems as zero gravity may be less than required. Since most of the countertop filters utilize one kind of medium to remove impurities, they may not remove all the contaminants. Some will quickly go through. However, you will still find more advanced systems with several filter media for efficiency, and of course at a much higher cost. This is the most crucial part of selecting a water filter system for your home or office. As mentioned earlier, countertop filters are not all the same regarding how they function. Some are better at removing some aspects from the water than others. For example, a particular countertop filter may be better at removing chlorine and fluoride from the water better than the rest. Before you can rush to acquire your water piece, make sure you are privy as to what you need to be removed from the water. Get a water testing kit and test it to know which contaminants are in it, and which require removing. Based on the test result, you can determined which water filter will do the right job to remove any contaminants. Countertop water filters come in two types (based on their water refilling process), and each one of them is different from the other. The first one is a water filter pitcher like this one, which does not require a connection to your filter but are quite efficient. These varieties may not seem important at first but have a few advantages. For example, they are ideal if you do not have sufficient countertop space in your kitchen. They are also portable, and you can take them to the office or on a hike. The shortcoming of a water filter pitcher is that you have to fill the filter periodically. However, the faucet filters need a connection to the faucet to function. They are a breeze to use, and quite efficient. And since they have a direct link to the source of water, they are quite reliable and provide a decent flow of water for the whole family. But that’s not all, the filters are easy to install, only taking a few minutes. Choose the water filter depending on the space that you have either on the sink or counter. Countertop filters come in a variety of sizes, and the ideal one is a matter of choice and space. Some pitcher filters are compact and will fit anywhere, like this one. Some water filter models have the ability to make the water more alkaline than the others. Typically, the alkaline water boosts your immunity system and supposedly has anti-aging properties. If you want you are looking for this property, then you might as well look for a machine that makes your water alkaline. No doubt the water filters will change the taste of your water, and some may consider the final water, sweet, while others may feel it sour. You see, some have become accustomed to drinking chlorinated water that filtered water tastes different to them. Also, some filters are quite efficient at dealing with hard water that they remove calcium and magnesium, as well. They, therefore, not only remove the various contaminants from hard water but also the beneficial minerals. In such a case, a water filter with a remineralizing capability, to return calcium and magnesium to your water is necessary. Regardless of the model you choose, you can never escape the hassle of maintenance that comes with countertop water filters. They eventually reach their optimal capacity, a point beyond which it cannot filter anymore. Some will require a change of filter every three months and others, nine months. Please note that the price is not a determinant of this period. In fact, some pricey models will require a filter change after three months while the cheaper ones will take longer than that, something like nine months. Typically, faucet countertop filters are more comfortable to use than pitcher water filters counterparts. All you need to do is connect them to a faucet, and turn a switch to run it, as simple as that. However, the pitcher water filters may be a bit hard to operate since they require frequent refills. In a busy office, the water pitchers are a lot of work. There are countless varieties of filters on the market, and some of them are more expensive than others. However, just because it’s expensive does not mean that it is more efficient at removing a particular variety of contaminants. Determine the kind of elements you need to be removed from your water, and then look for the water filter, ideal at removing them. Determine the maintenance period, as well as the cost of filter replacement before you can purchase your water filter. Everyone deserves access to clean drinking water. However, this is not always the case as most of our drinking water comes laden with all sorts of contaminants. Even tap water has chlorine and fluoride within it, which may affect your ability to keep hydrated, because of the repulsive taste. However, the best countertop water filter removes the contaminants that would typically make you sick and goes farther by making the water sweeter. In the above review, we reviewed each variety depending on some of the most important factors such as efficiency and ease of maintenance. Hopefully, you now know which countertop water filter you want for your household – yes we know that it’s not everyone that will choose our number one choice, and it is okay.